Finished pumpkin as written measures approximately 5 in. wide x 3.5 in. tall. 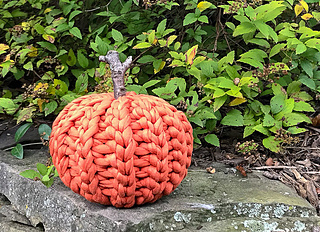 This little darling is sure to charm your decor all through the Autumn season! 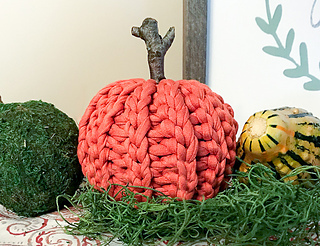 This rustic crochet pumpkin is made with T-shirt yarn and is super quick to work up! The pattern is great for all crochet experience levels as well since it’s worked flat, with no increasing or decreasing, and then seamed up and stuffed. The slip stitch pattern also adds a great knit-like accent.